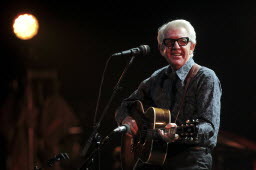 Nick Lowe has been performing in the Twin Cities so much over the past few years, he might want to consider buying a flat in Uptown. But because he was starting a new US tour Wednesday night AND playing at First Avenue, there was a tiny bit of hope that Lowe would dig deeper into his punk-rock bag and go all out. DIdn't happen. Say what you will about Lowe, but he's sticking to his mellower side. Not that he and his four-piece backing band were boring. But most of the numbers would have worked better in a more intimate setting, like the Dakota, where Lowe was terrific in his last outing there.From what I can tell from recent setlists, he's also sticking to pretty much the same songs he was doing recently in Europe. 3) "What Lack of Love Has Done"
5) "I've Let Things Slide"
6) "Has She Got a Friend"
7) "I Trained Her to Love Me"
8) "I Live on the Battlefield"
9) "I Read a Lot"
13) "Somebody Cares For Me"
17) "I Knew the Bride"
18) "When I Write the Book"
19) "(What's So Funny 'Bout) Peace Love and Understanding"
21) "Go Away Hound Dog"